Transshipping is increasing in popularity these days mainly because of two reasons. First, the rapid rise in export possibilities has not been matched by an equally fast expansion in port infrastructure. The existence of draught restrictions in access waters does often not allow for the direct loading of large vessels. And second, ports sometimes even have to deal with impositions. 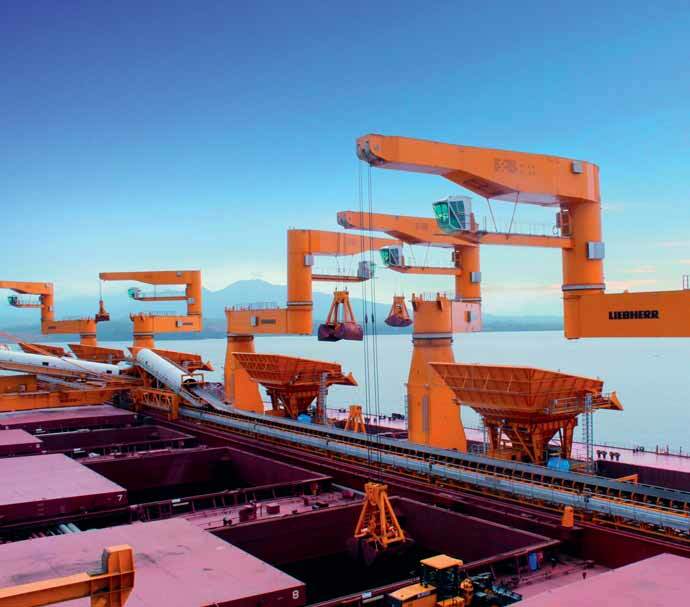 One of the most spectacular projects in transshipping in recent years has been a facility delivered by a Chinese shipyard for the South American mining company Vale. Equipped with five Liebherr double girder cranes, type MPG, this transship is handling iron ore from Valemax vessels in Subic Bay in the Philippines. Design and advisory services were provided by Logmarin Advisors of Genoa, Italy, and the 285,000 tonnes buffer storage floating terminal was built by Bedeschi. The five MPG 40-tonne high-speed, heavy duty, double girder jib cranes are side-mounted on the Vale vessel and have an outreach of no less than 42 metres. Safety, performance and low maintenance requirements are of utmost importance and the design of the MPG cranes considers all these features. less wear and thus longer lifetime of ropes due to special positioning of the hoisting winch. The five cranes have Litronic Robot Control (LRC) and Dynamic Anti-Collision System (DACS®), both developed in- house by Liebherr in order to increase safety and enhance performance. LRC eases operation between two pre-defined fixed points while DACS® prevents collision between the cranes and/or fixed obstacles as each crane knows and compares its position with the other crane or any defined obstacle. Two cranes can thus operate on the same hold or close to any obstacles, offering highest safety and flexibility. Due to the design focus on maximum safety and operating capacities as well as minimum maintenance and life-cycle costs the Liebherr double girder cranes are perfectly suited to the demanded round-the- clock working cycles on the transshipping facility.